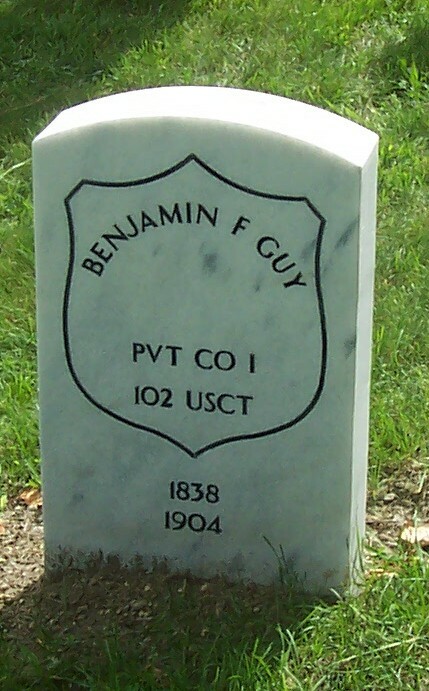 On August 31, 1864 Elijah and his brother Benjamin F. Guy age 27, enlisted as Privates in Co. 1, 102nd USCT Volunteer Infantry in Grand Rapids, Michigan. During the one-year he served, Elijah contracted consumption and rheumatic fever. Elijah and Benjamin were both mustered out on September 10, 1865 at Charleston, SC. They were paid and discharged in Detroit on October 17, 1865.